Superman really only has a handful of real enemies, and they're all been around for at least 50 years. Lex Luthor? 1940. Metallo? 1959. Brainiac? 1958. They get trotted out every few years, whenever writers get tired of using new characters nobody will ever remember. The first-born child of Garret McDougal, the leader of an ancient Gaelic clan, Siobhan McDougal was denied her right to assume leadership following her father's death by her uncle Seamus, who did not want a woman leading their clan, wishing instead for her brother Bevan to become the new patriarch. Angered by her uncle's presumptuousness, McDougal made a bargain with an entity called the Crone, in which she would be allowed to gain vengeance against her uncle and brother. 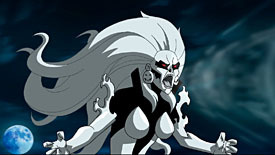 Possessing enhanced strength and teleportation abilities, the Silver Banshee's main weapon is her voice, as her sonic wail can kill any who hear it, leaving her victims as little more than dried husks. The Silver Banshee will not rest until her uncle and brother are dead, and is more than willing to kill any who get in her way. Silver Banshee is a relatively recent addition to Superman's villain file - "recent" in this case meaning "23 years ago." Comics are stagnant. She was the first new creation after Crisis, and has hung around mainly because of her snazzy black and white design and her convenient ability to exploit Superman's vulnerability to magic. While all the guys in this Target-exclusive DCU series get a new body for no clear reason, Banshee uses the same female body we've seen on every freaking female character in DCU so far. If you don't already own half a dozen iterations of this mold, then yes, it's very nice - the hips could perhaps be a little wider and more feminine, but for a plain, undetailed body, it's a good blank. However, if you do have the other girls? It's getting really tiresome seeing this every other series. We know the Four Horsemen have the skill to design more than one woman's body, so for cryin' out loud, Mattel, let them! 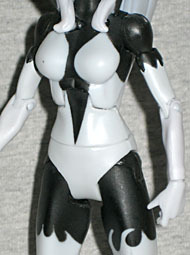 Like we said, the majority of Silver Banshee's appeal is her design. In the world of comicbooks, where every costume has to be as bright and eye-searing as the color wheel will allow, a character wearing plain black and white is an aberration, and absolutely stands out from the crowd. Surprisingly, though? No silver. Then again, Booster Gold wears yellow, so maybe the white is supposed to be a stand-in. Sadly, they opted only to paint the fringe or whatever at the tops of her arms and legs. In the cartoon, the edges were constantly in motion, whipping about like flames, so it would have been nice if Mattel had found a way to make them three-dimensonal on the toy. One thing the figure does copy directly from the film is the face. In the comics, there's a tendency to make everyone good-looking, since that's what artists are used to drawing. Animated Silver Banshee, however, has a decidedly unattractive visage: a pointed chin, a flat nose, a very square brow... she looks like a witch or crone, appropriately enough. 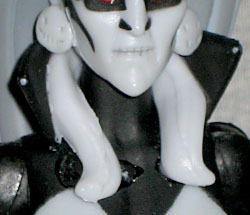 The skeletal design on her face is just painted on, but her narrow lips are parted to show her teeth. I know Poe hates extreme expressions, but this is a good balance between completely calm and permanently screaming. Silver Banshee has her large round earrings, but while they're sculpted with the little jack o'lantern faces, the details aren't painted in. The figure gets a new collar to match the one she wore in the cartoon, but there's an oddity here: in order to duplicate the animated design of her hair, which had two thick locks of it hanging down inside her collar, the toy's collar is sculpted with a bit of hair in it. It's a clever move, and it works the way it's meant to, but the hair is thesame pale gray as the rest of her costume, rather than the darker grey of the hair right around her face. Since it doesn't match, it looks more like a costume element than dangling hair. The figure has no accessories of her own, relegated to only the ubiquitous "Public Enemies" disc base, and the right leg of this series' BAF, Brimstone. Unlike the arms, the leg is not molded from translucent plastic: it's 100% opaque, dark red with a black boot and the edge of his trunks. The leg is 4¾" tall, and has all the joints you expect from a DC Universe toy. Surprisingly, Silver Banshee proved fairly easy to find. 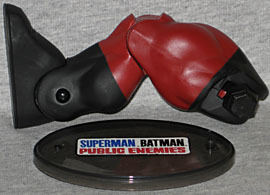 Now, she's not a pegwarmer like Superman and Batman are, but after going through at least three cases of Public Enemies toys, the figures from the fourth actually remained in stock for a few weeks. Compare that to Big Barda, Hawkgirl or Black Canary, who barely even touched the pegs before selling out and never being restocked. As a recurring Superman Family villain (she's recently been paired off against Supergirl) with a cool design and a low likelihood of ever seeing another toy from anybody, Silver Banshee is a great addition to the DCU line.